I hope you enjoyed your weekend. We had lots of sunshine and warmer days, which made me happy. I love having the windows open , the sound of the birds singing and seeing all the new growth in the garden. 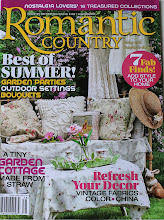 I am guessing some of you probably had a more exciting weekend but that is all it takes to make this gardener happy! Now,I want to show you one of the projects we have been working on with the help of a carpenter.In our living room( which was our bedroom several years ago )there where two closets side by side that we didn't need there anymore so I thought the space could be better used as a little reading nook or extra seating when all the family etc. come for a visit. So we had a carpenter come and tear out the wall dividing the closets and build this cosy little nook. I have to make a few cushions for it and the foam has to be covered with the material instead of just wrapped over it but that can be a rainy day project. We had wall sconces installed to make it bright for reading but I would like them on a dimmer for cosiness when nobody is reading. There are two large drawers for storage underneath. I got these corbels at Winner's( tjmaxx) and I think they worked well here. It wouldn't be me if there was no toile but I am using a plain natural fabric on the seat but I am wondering about making it reversible on the other side with a different fabric so when I need a change I can flip the cushion. I did try it with the mirror up top but wasn't sure-what do you think? Now this is what it looked like when the carpenter took off the wooden doors and knocked out the dividing wall. Below is an updated photo of our reading nook. 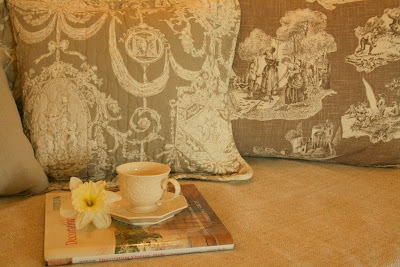 Would you like to linger with a book and a cup of tea-stay as long as you like! 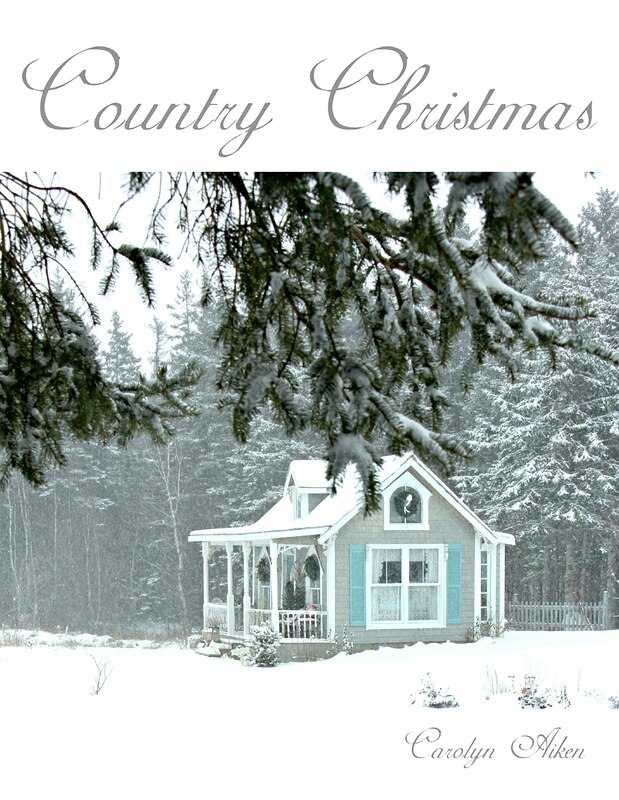 Today I am joining in with Cielo at The House in the Roses for show off your Cottage Monday and Susan at Metamorphosis Monday at Between Naps on the Porch.Be sure to pay these lovely blogs if you haven't already. You've created a truly beautiful space. I love it! Beautiful! What a perfect spot to read, write, and relax! It looks like a dream! Okay, wow, wow, wow. I looove that so much. Amazing transformation. I vote no mirror. It's perfect in every way. Saving your pic for my inspiration file. 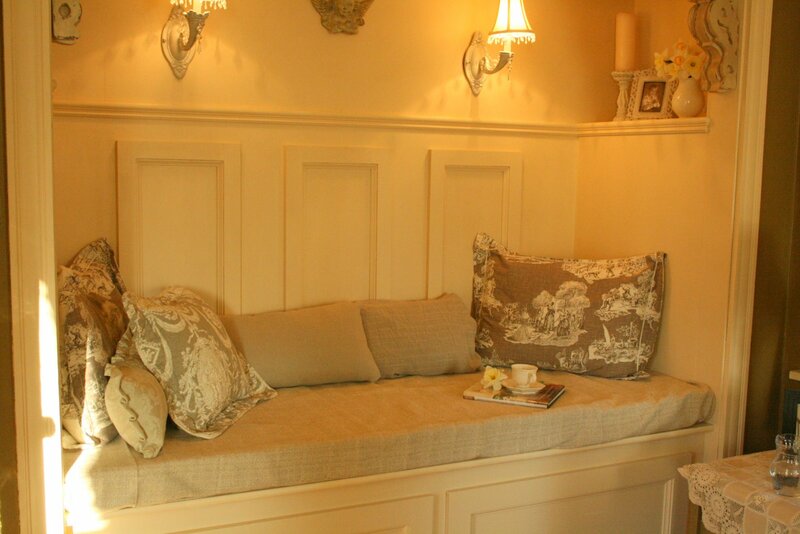 I love that nook with the cozy seat. I believe I like it better without the mirror. Your reading nook is darling and I think it looks great. The use of space is wonderful. So glad that you have shared pictures with us! 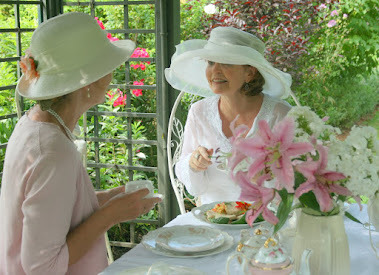 Hi Carolyn, I would love to linger with a book and tea. The reversible seat cushion is a great idea, you can change the color at a flip. Sorry I do not like the mirror between the lamps. It is a beautiful reading area. Take care. 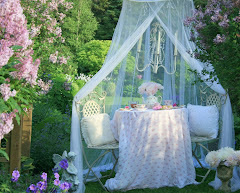 That is just the sweetest nook! How creative to use that space in such a way and you still have storage underneath. Can just see the grand children cozied up there for a storybook reading! Lovely! Oh I do love this little nook. I have wanted to put one of those in one of my rooms, and this just might be my inspiration. Thanks so much for sharing. 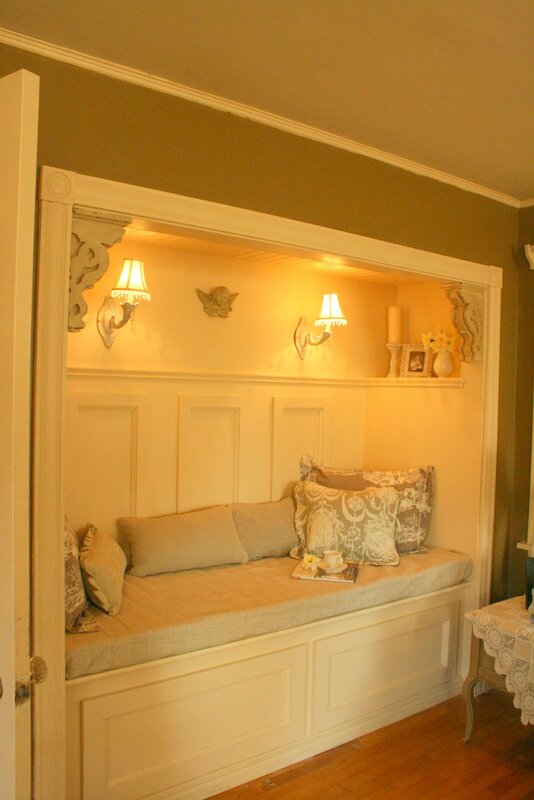 That was a great idea to make the reading nook and it does look cozy. I like the mirror between the lights; guess you'll have to leave it up for a few days to see whether it works for you. Wow, I think I want to stop right now and do a little reading in your nook. Great job! Your reading nook looks like it's going to be a wonderful place to relax and enjoy some quiet moments. You have done a great job Carolyn! I vote "no" on the mirror. Enjoy your beautiful reading corner...! Yeah, I'd like to linger! I love your attention to detail - the wood slated ceiling in the nook makes it feel like an old front porch. Perfect! 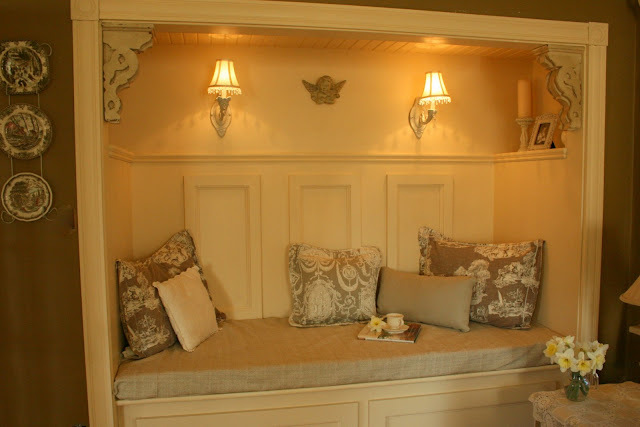 What a beautiful and cozy reading nook! There are no words...I just am left breathless. Beautiful place to be inspired. What will be next for you, may be hard to top this one. I think I am in LOVE! FABULOUS! 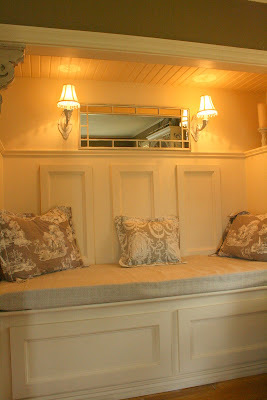 I love what you did with that space AND it could be an extra bed as well - and what great storage. Now I wish I had such a closet to make such a space -- but, alas, I don't! I like it with the mirror best! So cozy and beautiful space. I think you need a coffe pot next to it so you don't have to move for hours in the morning. I love love love it. The netural colors you used are so great. Carolyn, I am amazed. It seems like you are always working on projects around the house! The reading nook is beautiful! Such a lovely space to curl up and read a book! such a lovely nook.. very comfy and good place to hide and chill out..
That is a wonderful space. Perfect in so many ways. I vote no on the mirror. Wow! Love love love, excellent use of that space, and of course your decor style makes it even better. I vote for no mirror. I love this..and you have a great carpenter! Flawless. Hi Carolyn! Your reading nook is beautiful! It looks like it's always been there. 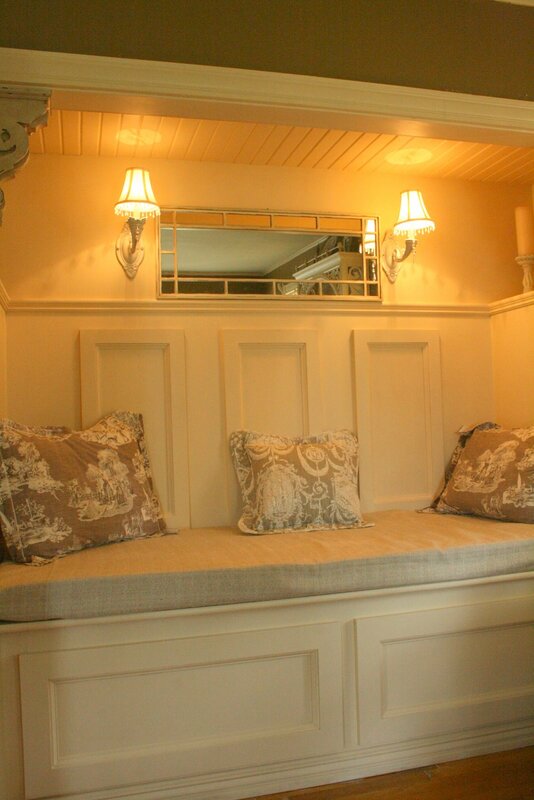 Love how you've dressed it with the cushions and toile pillows. Your corbells are perfect and the lights - they're just right. Oh, what a wonderful spot. You've really been busy, haven't you? I love it. 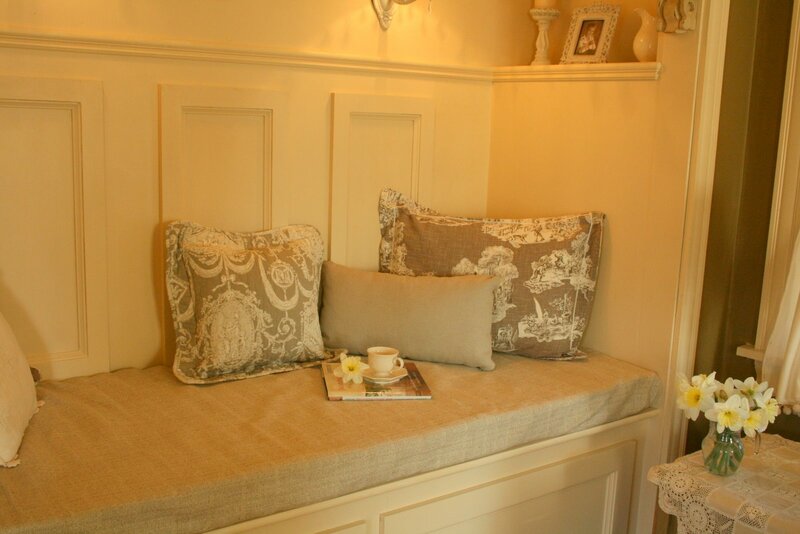 Beautiful nook--of course you MUST have toile! I have it in many rooms too. I love the addition of the mirror and its reflection gives wonderful depth--it's such a cozy spot. It's gorgeous! Your so very talented! I like it the best with the angel, but I the mirror is still gorgeous! I wish I had a closet to turn into a reading nook. I just love it! It is so beautiful. I am going to have to see if we can make something like that. I love to read and be cozy at the same time. What a lovely idea! I love the touches of toile. I think I like it without the mirror but you will make the right decision. It will be lovely whatever way you decorate it. 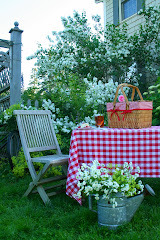 Have a wonderful day and would love for you to join me for Tea Time tomorrow. Your reading nook is beautiful. What a wonderful way to utilize a closet that was no longer needed. Thank you for the inspiration. It's beautiful. Your reading nook turned out great. 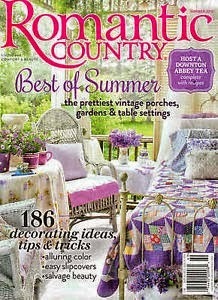 I'd certainly be spending a lot of time there with a cup of tea and a good book if it were in my home. I like it without the mirror, but either way it is a very pretty spot. I love your reading nook, so sweet and comfy looking! 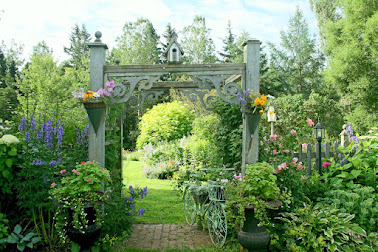 I love the exterior of your home your gardens are beautiful. I see you have a climbing bush in the corner. Please tell me about it? I'm considering Something that climbs for the outside of my home and can't make up my mind. 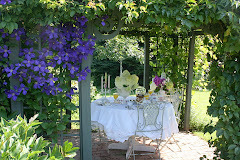 I am training a wisteria across the back sunroom wall to provide shade in the summer. So far so good. Thanks so much. Oh Carolyn, so cozy and peaceful that little nook! Bless you and yours as well as the cottage you live in. 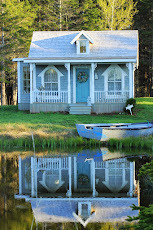 Thanks for participating in "Show Off Your Cottage Monday"
Carolyn, You have an exquisite taste!!! C'est merveilleusement beau! Great, great job!! it's a very nice space, i love the colors. 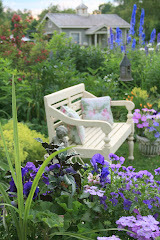 I love this special place, Carolyn - such a beautiful spot to curl up and read, visit, or just dream. And I do like the mirror; it seems to give a little life to the nook, although it already has a lovely, cozy life to it. Now enjoy! I love the mirror also! Very charming! Brilliant! What a fantastic idea for your old closet space, I adore it. I think I too prefer it without the mirror. 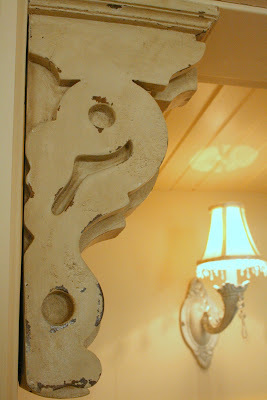 And I really really love the corbels...really from Winners? I'm going to have to make a trip there, they are beautiful! 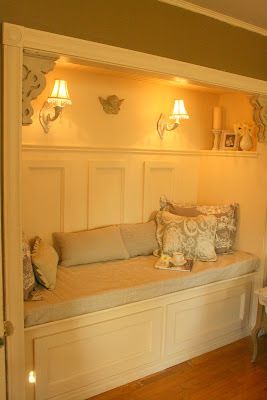 I love your reading nook! Those corbels look like the real thing - great find. I think the mirror is a tad too wide for the space. Wow! What an amazing makeover for a closet!! I love the creams you chose for the color pallet. It looks so relaxing there, and with the sconces lighted, how gorgeous is that? I've been saving this post for a quiet moment but, now, I must, also, leave a sleepy comment. Those colors are some of my favorites. Such an elegant combination. Oh, Carolyn, this is a brilliant renovation. Congratulations! Have fun with your new space! I made the comment and then went back and looked. I saw it fresh. The angel is Sooooo adorable but it feels like a cave. You don't seem like a cave dweller. =] The mirror makes it feel more Edwardian. Can't go wrong either way, can you? I would sooo... love a little nook like that. It really does feel cozy and inviting. Such a good choice for that space. Lovely and it looks like a dream! Carolyn, you had a perfect idea for this spot in your home. And, the outcome is gorgeous. 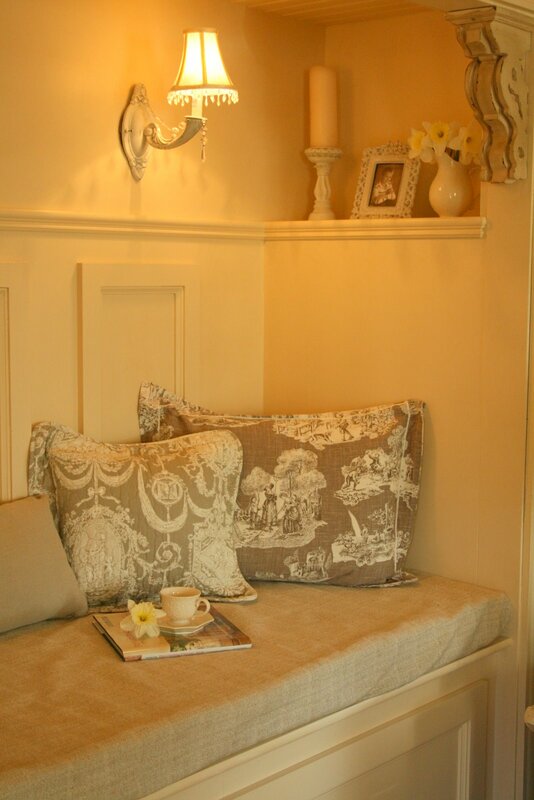 I love this pretty nook. Love the way your nook turned out with the soft colours, the toile pillows and the lamps! What a transformation from cupboards to seating area :-)! I am glad the weather is beautiful on PEI. We have a lot of sunshine here as well. It hasn't rained for some time now. We could definetely use a shower! I believe at the end of the week we will have a change of weather. Our garden will be very happy with that! You're so creative Carolyn - what a great use for that space. What a wonderful reading nook you´ve created. Love the white, cream and beige tones. The toile is beautiful. Really a great place to have for different occasions. Your mirror is lovely but I´m not crazy about it in that particular place. 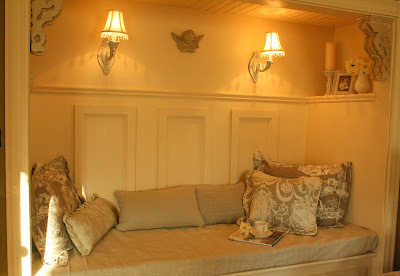 The reading nook is lovely, a place to rest awhile. I so love this. I am so going to do this in one of my closets soon.Pinning this for sure. I vote no mirror. Very unique and beautiful. If I ever have a house again, I would love to do something like this. Wow, I love it, your so lucky! I adore your reading place. I will find a place for one just like yours!